Kayak the scenic East End Lagoon. 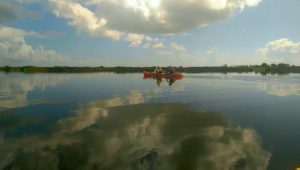 An easy paddle in natural wetlands on the east end of Galveston Island, you can discover myriad bird species wading in the water and flying about. You can also view large vessels entering into the Houston Ship Channel adjacent to the lagoon. Spend two hours exploring the beauty of this area with Artist Boat. Beautify the Bucket Registration is Open!